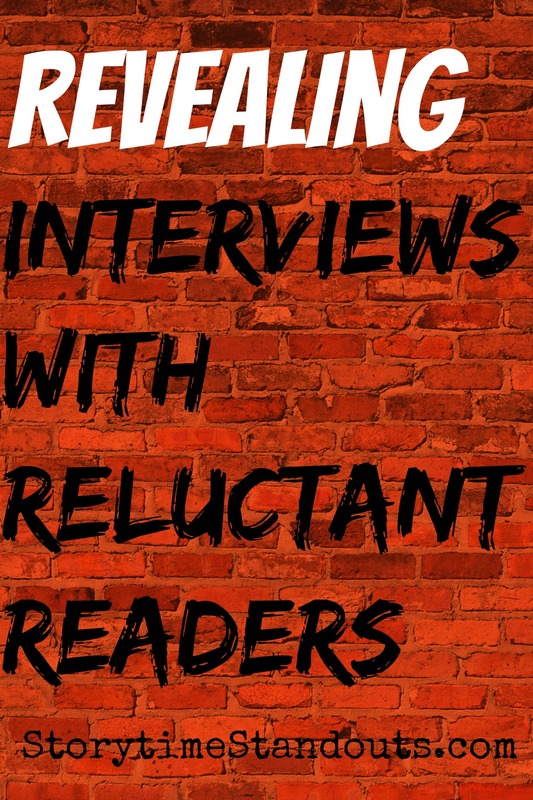 Our guest contributor asks, Is there such a thing as too much reading? We all want to see our children reading. Even parents who don’t love to read, (such as my own dad who refuses to) like to see their children enjoying reading. We know that it’s part of what makes us successful in life. Reading and comprehension open not only figurative doors, but literal ones as well. 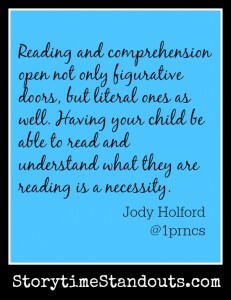 Having your child be able to read and understand what they are reading is a necessity. However, having your child read just for pleasure and the magic it provides, is a gift. As much as we try or don’t try, we can’t always determine whether our children will love the act of reading; of falling so far into a story that you feel like you’re part of it. What if, however, your child is falling so far into the story that they refuse to come out of it. For those of you that struggle to get your children to read their 15 minutes a night, this might not sound like a problem. However, I’m facing a dilemna that I don’t know how to solve. My husband, myself, and our children LOVE to read. We read constantly. Both of our children read far above their grade level and while I would love to say that’s our influence, (and, in part, it might be) I don’t think that’s the only factor. I say that because I know parents who foster a love of reading and it’s still a chore to get their kids to read. So, I’m very grateful that my children love their books. They are more likely to choose a book for a long car ride than their iPods. They’d like the iPods too, but are content with a pile of books. So how can this become a problem? 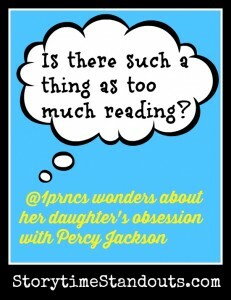 This morning, my oldest daughter, who is caught deep in the trenches of Percy Jackson and the Olympians Lightning Thief saga, came downstairs, hugged me, went straight to the couch and crawled back into her book. When we spoke to her, she didn’t hear us (most likely because of how loud the cyclops and strange animals in the book are), when her sister asked her to play, Polly Pockets seemed a ridiculous choice over the half man-half dog that she was reading about. When we made her put down the book, she was less than impressed, in the way only a preteen, emotional girl can be. Now I’m hovering between pride, that she loves this book so much, and irritation because she won’t do anything else. I felt absolutely ridiculous telling her to put down her book and spend time with her family. I told my husband that I felt like I was punishing her for reading, which is the very last thing I want to do. How can I be irritated that she’s reading? Then I started to think about the books that I have on the go; several, as always because I can’t read one thing at a time. Also, I currently have two manuscripts I’m working on open on my computer. I’ve got cleaner on the table because my plan is to spend some, much needed time cleaning. There are waffles on the counter because my youngest was desperate to have them. It would have been nice to stayed tucked up on the couch reading my own book, but the youngest is rather persistent. The point is, even though we want them to love reading and know that it will give them so much pleasure as they get older, balance is still the key. We have to still be able to attend to our lives, even in the midst of a great book. I understand my daughter’s obsession very well; she gets it from me. When I get into a book, reading or writing, it can consume me. If my characters are unhappy, my mood is affected. Likewise, if they are happy, so am I. It’s wonderful to feel this much a part of a book and a great cudos to an author that they brought you into their world so completely. Still, we cannot forget the world around us that inspires and creates these stories. We cannot lose ourselves so completely that we miss out on what is right in front of us. It bothers me to tell my kids to put down a book but I have to sometimes, the same way I’d tell them to put down their DS or iPod. Okay, maybe not the same way; I’m far more likely to let hours go by just reading than I would be to let hours go by on the electronics. All the same, the world is still going on around us and it is very easy to forget when we aren’t paying attention. I don’t think I’ve solved my quandry because I still feel both guilty and justified over making her put down the book. Plus, now I have to see what’s got her so hooked. She has not loved a set of books like this since Harry Potter. Anyone who knows how obsessed my daughter has been with Harry Potter knows: that is saying something. She has decided that Rick Riordin is her favourite author and is reading anything she can get her hands on by him. She talks about his characters as though I’ve read every page with her; she starts telling me about something and only when she mentions half-animal bodies do I realize she’s not telling me something about her friends at school. She is IN those books. I love that; more than I can possibly say. But I still need her to be IN our life; playing with her sister, helping around the house, laughing and talking with us, and being a part of our day. I suppose, like anything else, we have to teach her how to employ that balance. If the author didn’t come up for air sometimes, hadn’t had the experiences he did, if he hadn’t loved mythology, or had a desire to share stories with his own kids, she wouldn’t be reading these books that have her so captivated. Living our lives is what makes for great stories. While it’s an amazing treasure to get lost in the stories that someone else has created, we have to remind ourselves that real life is pretty cool too. Rick Riordan is one of my youngest son`s favorite authors. I think he has read every one of his books at least once. It is amazing how much Greek mythology he has learned through the Percy Jackson series. I’ve read a couple of the books and can understand why they are so popular.